Time for a Marriage Tune-up? Even though I write a lot about divorce, I’m definitely pro-marriage ... especially my own! This past weekend, my hubby and I attended a seminar titled "How We Love" presented by Milan and Kay Yerkovich. Kay is a licensed Marriage and Family Therapist. Milan is a former pastor and has a counseling practice. Together, they’ve written the book, How We Love, that describes how they help individuals and couples discover their love styles. Tune-ups can often take a marriage to an even higher level. As our understanding of human behavior grows, so does opportunity for better communication and interaction. And, even though you and your spouse or other significant person in your life may be on really good terms, tune-ups can often take thatmarriage to an even higher level. In going through counseling after leaving my long-term marriage, I was asked to identify my part of our dysfunction. I knew on an intellectual level that surely I had a role, but, since my husband’s behavior was so glaring, I had difficulty identifying where I’d gotten off track, too. That’s the way life is, isn’t it? Our egos help shield us from our own faults. That’s the way life is, isn’t it? Our egos help shield us from our own faults. At the conference, we learned how our love styles are formed at a very early age, and continue to influence us as adults. Understanding our childhood patterns makes owning our adult behavior much easier. Understanding the source of our mate’s behavior also elicits empathy rather than blame. It gives a means of recognizing and dialoging about the marriage dynamic. Don’t get me wrong; not every marriage can and should be saved. But, if yours is basically a good one, I encourage you to cherish it and take time to nourish it. Seeking out opportunities such as How We Love, is a great way to do so. While writing a few blog posts about domestic abuse of women within the global church, I began to wonder about my own church, a network of congregations called Christ the King. ​I approached our new pastor, Rick Snodgrass, concerning this issue. His eyes lit up. "My previous church had a wonderful program," he responded. "I'd love to describe it on you blog." I’ve always believed that if we just walked obediently with what we already know, all of the ministry needs of the church would be attended to. Years ago one of our presidents said that when he gets up to speak, what he’s really doing is telling people to do what they already know they’re supposed to do. Attending to domestic abuse is one of those situations. ​the church may be the last bastion of hope. I know that church means a lot of different things to a lot of people, and for someone who’s going through domestic abuse, the church may be the last bastion of hope. Rarely will someone come up and say I’m going through a domestic abuse situation, how can I be ministered to here in my church? A certain amount of secrecy is a big part of this ministry. ​The good people at CTK Church in Nampa were invited to take the first names and ages of children in abusive homes and buy them gifts. Those children were a part of domestic abuse situations and were staying in secluded locations with their moms. So the day that they got those presents was the day that everyone who bought them believed in the ministry, even though they couldn’t be there to watch. A certain amount of secrecy is a big part of this ministry. That means trust needs to be built with victims, and those who are loving on them need to trust the ministry to do what they say they’re going to do. The fire department showed up with an engine and we had a really fun Mr. and Mrs. Santa Claus there. We called out names and gave specific gifts to kids, while mother safely observed and felt the love of Jesus. The other event that people in our church put on in secret was a family fun night where mothers of domestic violence and their children could go through several fun stations like a private community fair just for them. While the kids were playing at the fun fair, the mothers were going through a large area where gently used items had been donated so that they could do some free shopping with integrity. There are many things that people in church can do. There are many things that people in church can do; so as you read this in the blog today just know that these kinds of ministries take place when listening people respond to the Holy Spirit and get creative. Is he knocking at your door today? Is this something that God has laid on your heart but you just needed an idea? Let your local pastor know that you have a great idea and see how resourceful he can be in providing something that very few churches get a chance to respond to. Be blessed. Linda's note: I hope you find encouragement from Rick's post to listen to God's call to serve as the "good people" in Nampa's CTK church did. Do you ever look back and think about lessons you’ve learned through life experiences? Being of a certain age, I’ve garnered a host of lessons life has taught me. And, because I’m a memoirist, I enjoy writing about them. The next step, is sharing them, and that’s exactly what I want to do. I want to share them with you … for FREE. ​You see, God made me a writer and a giver. In addition, He gave me curiosity and the drive to try new things. I’ve been a seamstress, an interior designer, an art teacher, an entrepreneur, a retail clerk, a cannery worker, and a weaver to name a few. I’ve sung in choirs all my life and have always had a garden. I’ve also been married three times (not something I’m proud of). ​I share three main lessons. In my up-coming memoir, God, the Devil and Divorce, I share three main lessons: #1 learning what it's like living with a man who practiced “crazymaking” on me, #2 discovering there is a huge dichotomy in the Christian community around the issue of divorce and how those who have chosen divorce are treated, and #3 learning that relying on the Lord to help me choose a husband is the smartest thing I’ve ever done. I now support people with similar experiences through this blog, Help and Healing for Divorced Christians, which is free, of course. But I have so much more to share beyond those three themes. And I’m happy to share them with you … for FREE. I’ve written a series of practical pieces I call Life Lessons that you may find applicable to your own situation or simply entertaining. I’ve combined the first four lessons into a PDF ebook complete with illustrations. There's even a recipe to share with your grandchildren. I want you to have this little book … for FREE. Just fill out the form and I’ll send the link to you in an email. You’ll also receive my monthly newsletter, as well as up-coming bonuses. I hope you enjoy these “Lessons” and you’ll let me know if you can relate to any of them. And feel free to share this link with your friends. ​Full disclosure: you can unsubscribe at any time. By remaining a subscriber, you’ll be helping me get the memoir published. Sound good? Linda M. Kurth is a writer and a divorced and remarried Christian. In going through the divorce, she experienced a dichotomy of responses from the Christian community. After sharing some of those experiences in her upcoming memoir, God, the Devil, and Divorce, she's heard many stories of divorced Christians who have struggled with the same issues. Linda seeks to give encouragement to divorced Christians and to remind churches that they should be a source of healing and grace. Is there a difference? Theo Pauline Nestor’s memoir, How to Sleep Alone in a King-Size Bed, describes her first nights after the sudden parting of her husband. Luckily, a girl friend understood the shock of adjustment and spent those nights with her. But soon, Theo had to adjust to sleeping alone. to permeate every cell of my body. Feeling utterly alone after my divorce was a shock to my system too. Although I could have seen it coming for years, as soon as I waved goodbye to my soon-to-be-ex for the last time, I faced an uncomfortable void. What was I going to do with myself? The feeling of being alone washed over me and seemed to permeate every cell of my body. That feeling would last for some time. Our son was grown and out of the house, so my main physical contact was gone. No one to bump into. No one snoring. Literally, no body in my space. I was physically and socially alone in my home. Like Theo, I relied on my best friend to help me get through the first few days. Best friends can be great talk therapy, but I knew I’d soon have to face the reality of living alone. I learned divorce can be both physically and mentally depleting. I spent the first few months sleeping a lot ... between nightmares that is … alone. ​a woman is likely to begin redecorating. In reading many divorce memoirs, I’ve discovered that once the immediate shock of the divorce is past, a woman is likely to begin redecorating. What better way to signal a fresh new start? Out go all traces of the ex. Now there’s room for expression of one’s self. Even though I was renting, and even though my couch was my only new piece of furniture, I transformed my home with new accessories. With each small change, I felt less alone. Another important step I took in my recovery was joining a singles group at a large church in my area. Following our Sunday morning meetings, the group had lunch together, which filled a big hole in my life. After attending a few meetings, I joined the activity committee and was able to influence the choice of hiking and field trips locations. Soon, I was part of a tribe, doing what I enjoyed, and not so alone. I experienced a shift in my thinking. Eventually I experienced a shift in my thinking. I no longer thought of myself as being “alone,” a description that seemed sad, pitiful, and, well, lonely. Instead, I identified as being “single.” Single is a neutral state, neither positive nor negative. I became fine with that. Along my divorce recovery journey, I discovered other satisfying things to do as a single person. Getting out of one’s comfort zone, although scary at times, can do wonders for self-esteem and a general feeling of well-being. Think of yourself as a single person and try as many of the 30 Things to Do that appeal to you. Or come up with your own. Consider one of my mottos: “You never know ‘til you make your move.” Give it a try! This comment on one of my blog posts touched my heart. Being scared, anxious, afraid — these are typical emotions associated with divorce. But as Christians we are encouraged not to be afraid. There are up to 40 passages in the bible that seek to assure us we need not fear. And yet we do. Cue the guilt added to what we’re already feeling. My divorce fear began when I seriously considered leaving my husband of twenty-five years. My writing business was not profitable and I had no good job prospects. I worried about the amount of spousal support I might get. Our child was grown, but, of course, our divorce would still have an impact on him. Would I, over age fifty, ever find love again? I worried that maybe I hadn’t tried hard enough to make our marriage work, and I wondered if the Lord wanted me to try some more. One of my Christian counselors was so appalled that I would consider divorce, she refused to talk with me about it! So I dragged my feet; my fear of leaping into the unknown was worse than staying. Until it wasn’t. Little did I know my fears would be magnified when I finally left, with nightmares, two panic attacks, and a hallucination. I write about these fears in my up-coming memoir, God, the Devil, and Divorce. Ouch! How do I answer that? After some pondering, I’d say that God doesn’t just snap His fingers and all is rainbows and bunnies. We are students at His feet, growing in knowledge of Him. And often we are not ready to learn until we go through hard times and realize we can’t rely on ourselves alone. That was me. Thankfully, God was patient, encouraging me to learn to trust Him and His provision. Learning to let go of my fear was a process, not an overnight-transformation. There were days I had to make the effort to lay aside my fears on an hourly basis. The Lord wants our participation in the healing. We are to listen to Him so He can direct our paths. I asked God for guidance, and received much help along my road to recovery, taking advantage of several tools for healing that were available to me. As I did the best I could, God came through for me in miraculous ways. ​Like the woman who wrote on my blog, I hoped to marry again someday. I was able to put aside my fears of being alone, and told the Lord I would wait for the man of His choosing. I was fifty-eight when I met the love of my life. From our conversations, it was clear God had a hand in our finding each other. I pray the woman who wrote me will wait upon the Lord, trusting she will find the love she is seeking at the perfect time in her life. I want you to know that, even though you will probably experience some level of fear, with the Lord’s help, you can get through it. Click here for 10 tools that will help you as you seek to overcome divorce fear. I’m disappointed. In my last post, I promised to highlight some success stories of domestic abuse victims who have been helped by their churches. I didn’t want to “out” anyone. I simply wanted concrete evidence that these programs are working. I’ve contacted Safe Havens, an interfaith organization that trains churches on how to help victims. I’ve sent messages to churches that I know have programs in place: the Presbyterian Advocacy Committee for Women’s Concerns, to the United Methodist Justice Committee. I’ve asked people I know personally. And I’ve got nothing. I failed and I’m sorry. However, I also promised to give you a list of resources. That I can do. The following are only a few of the many Internet and other resources available. Also, check out your local church and community resources. Please note, I cannot be held responsible for the results in contacting any of these sources. What Happens When Churches Don’t Respond? Domestic abuse or violence is defined as a pattern of abuse where one person exerts power and control over another in an intimate relationship. The abuse can be physical, sexual, emotional, psychological, verbal, financial, or spiritual. Surely churches that hear of abuse rush to the aid of the victims, right? Unfortunately, no. 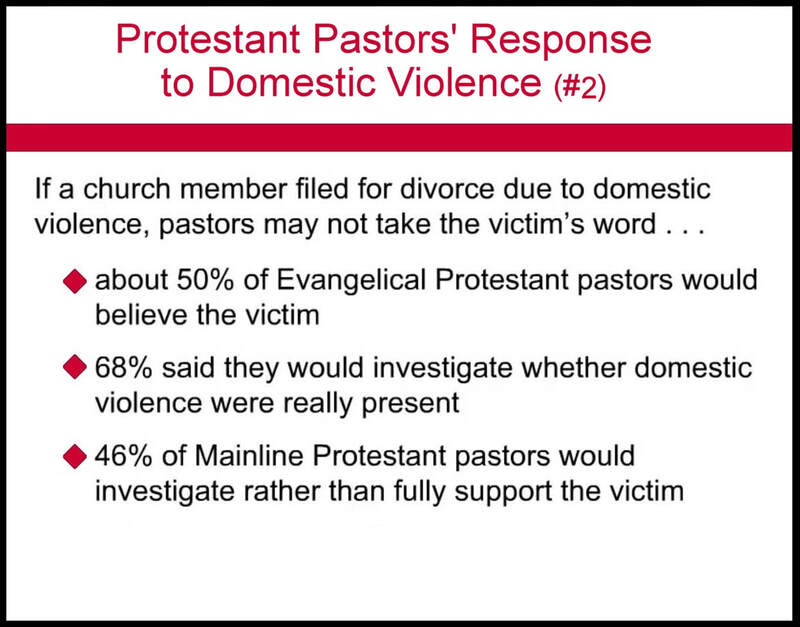 ​All too often pastors and parishioners encourage women to stay in an abusive marriage. The reality is, if a victim of spousal abuse who’s afraid for her or her children’s safety goes to church for help, rarely does the church have the necessary protocols in place. Church leaders may even urge the abused to forgive and reconcile with their abusers, emphasizing a theology of suffering, and using Scripture to elevate the sanctity of the marriage covenant over the safety of the abused. According to the National Domestic Violence Hotline, 1 in 4 women (24.3%) and 1 in 7 men (13.8%) aged 18 and older in the United States have been the victim of severe physical violence by an intimate partner in their lifetime. Simon Smart, Executive Director of the Centre for Public Christianity, referred to theologian Miroslav Volf’s observation in an article about how “Submit to your husbands” is misinterpreted. Volf calls the misinterpretation “thin religion ... stripped of its moral content and used as a weapon for goals completely unrelated to the faith.” This may be the case when pastors and male leaders in the church seek to retain control and keep women out of leadership. Dr. Keyes suggested that women stay because of finances or their children and that they often do not see a way out. An article, #WhyIStayed: How Some Churches Support Spousal Abuse reveals other reasons. Spousal abuse may be considered a “family issue” and not a criminal offense. Reconciliation and forgiveness by the abused is often more convenient than facing the seriousness of the problem. Women are seen as inferior to men. Church leaders take Bible passages concerning the role of women out of context, falsely claiming women are to be silent and to submit to male authority. Churchgoers and victims themselves may have fears about being “bad Christian witnesses” to the congregation and the secular community if the abuse is revealed. ​Today, more and more churches are realizing they’ve too often been enablers of domestic abusers. ​​Today, more and more churches are learning that their responses to abused parishioners have been wrong, pure and simple. They’re realizing they’ve too often been enablers of domestic abusers. Emotional trauma to the victim. If a woman decides to leave her abusive spouse, she often leaves the church as well after discovering it does not support her decision to leave a dangerous relationship. This parting can be an additional source of trauma, because the church may have been an important part of her life. The result: the one place an abuse victim can go to for safety and support becomes a place of pain and shame — in other words, more abuse. ​Physical trauma to the victim. 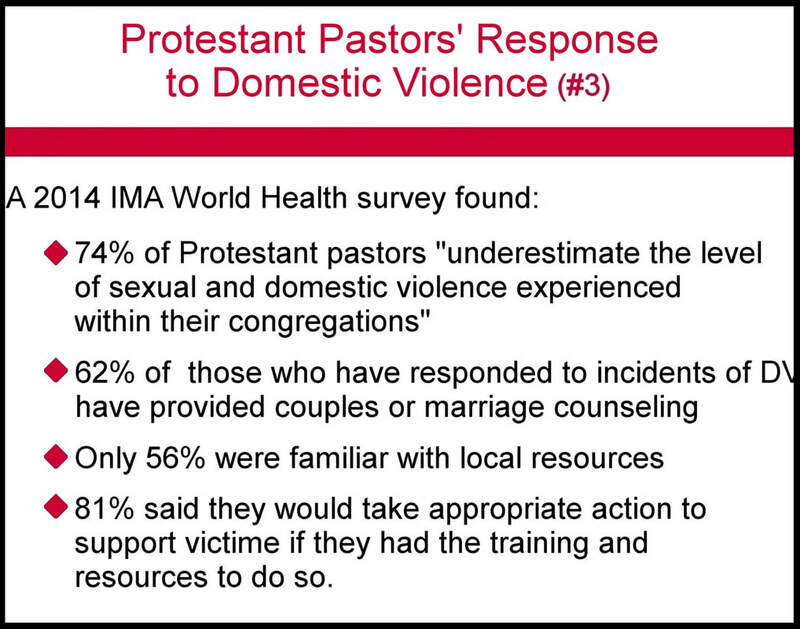 ways churches respond to domestic abuse victims. In one instance of a church encouraging the victim to return to her abuser, sadly, she died at the hands of her abuser. The church could bring harm to itself. Often a church isn’t aware of its legal obligations, let alone attuned to its responsibilities as an institution entrusted with the spiritual care of parishioners. Why is that? A church that chooses to turn its back on domestic abuse victims in hopes of protecting its image may in fact be harming itself. In the article, Why Domestic Violence in the Home Endangers Your Church, church security expert Carl Chinn says, “As Christians, we are dedicated to the preservation of the marriage, as we should be. But when there is abuse, or even the suspicion of it, we, as the church, often refuse to recognize it for the danger it is.” Chinn says this is a mistake with potentially grave consequences. Statistics show that, in 2016, eleven of the forty-seven murderous attacks at churches and ministries had the same cause: domestic violence. The article goes on to state that pastors can be “naïve and easily manipulated.” They are often recruited to speak on behalf of the abuser during legal proceedings. Rarely do they speak in support of the victim. We should ask what is wrong with this picture and how can we be change agents. How can churches become places of safety and support for abuse victims? What could compel them and how would they begin? Following are steps I’ve gleaned from various sources that churches can take. Understand what domestic abuse is, realizing victims of abuse are very possibly in the congregation. The church needs to be alert to the signs of domestic abuse and recognize its unique role in helping abused women who see the church as a safe place to come for help. Physical violence is often the most obvious abuse, but women also experience verbal, emotional, or sexual abuse by their husbands or partners. Once church leaders have become informed, it’s important for them to educate the congregation on how they can support the abused. Begin with sermons on the subject. A study called I Believe You: Sexual Violence and the Church, by Sojourners found that, of pastors who responded to a survey, 65 percent had addressed domestic and sexual violence once or never in a sermon, 22 percent addressed it annually, 33 percent mentioned it “rarely,” and 10 percent had never taught on it. Change needs to happen from the pulpit to the pews. When a victim comes forward, it’s critical that church leaders’ first impulse is to listen and believe the victim’s feelings and listen to her story. 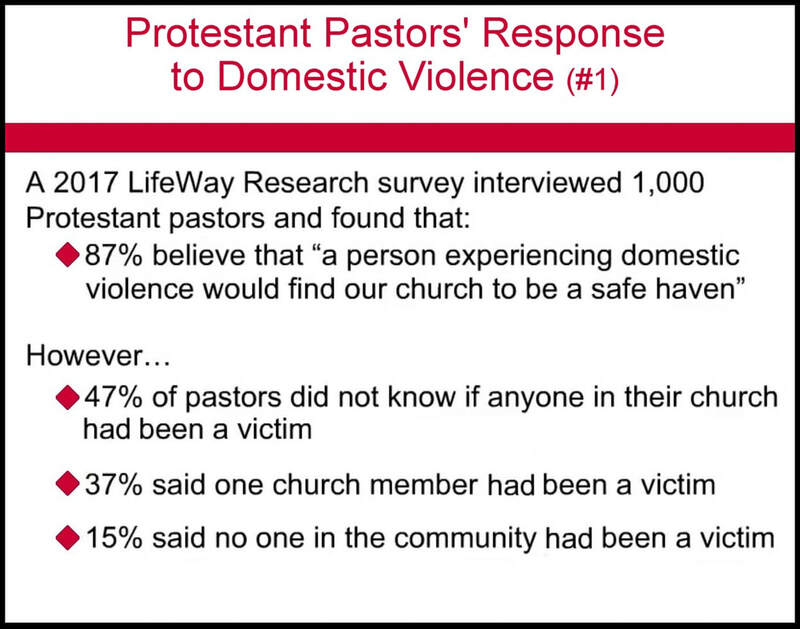 In a Lifeway Research Survey of evangelistic protestant pastors titled Protestant Pastors’ Current Responses to Domestic Violence, about 50 percent said they would believe the victim, 68 percent said they would investigate whether domestic violence was really present, and 46 percent of mainline protestant pastors would investigate rather than fully support the victim. Churches can reduce trauma and even save lives by taking action to help abused women get to a safe place. They must remember an investigation of the abuser’s actions could prove fatal to the victim, if he feels threatened and takes his abuse to a higher level. It’s vital for churches to reach out to the community for support. The church and the community become stronger when they work together. The church should offer informed counseling or help the victim connect with other resources within the community. Community organizations will have access to government resources and training not available to the church. Connecting victims with support groups, prayer partners, and providing ongoing emotional and practical support are other important roles churches can play. Churches should prepare to offer support and guidance for years, not days or months, even if the victim is receiving professional counseling. While many churches historically have fallen short of being places of refuge and active support to victims of domestic abuse, all churches need to develop the resources to help reverse this troubling crisis. Would you like to hear about the results of churches implementing policies to support victims of domestic abuse? So would I. I’ve already begun contacting those in the know, and will be reporting back to you, as well as providing a list of resources. If you know of an example of how a church has chosen to help, please let me know in the comments below. Stay tuned!